At a glance, Practical Environmentalism might seem to be our version of a corporate sustainability program; however, it differs from conventional programs in some important ways. Many corporate sustainability programs are compelling on the surface but are driven by profit or cost-cutting motives. A popular example of a conventional initiative is paperless billing. Often promoted as a way to partner with customers to help the environment, it is realistically first a cost-saving rather than sustainability measure. Paperless billing is far from a bad thing, but it contrasts with what is possible when a company has environmental principles and strategic priorities at its core. Practical Environmentalism is different than conventional business sustainability because it is a strategic priority that pervades our entire organization; it says that it is our responsibility to leave our community in better condition than we found it, and makes it is a strategic priority to find a way to do that profitably. Prioritizing it in this manner enables and encourages individuals and leaders throughout the organization to execute and innovate in sustainable ways. Whether it’s our Product Management division striving to develop new products that optimize raw material sizing or our Procurement staff seeking out like-minded regional suppliers, our commitment to the environment informs the way we conduct ourselves on a daily basis. This commitment is also evident in our organizational culture. 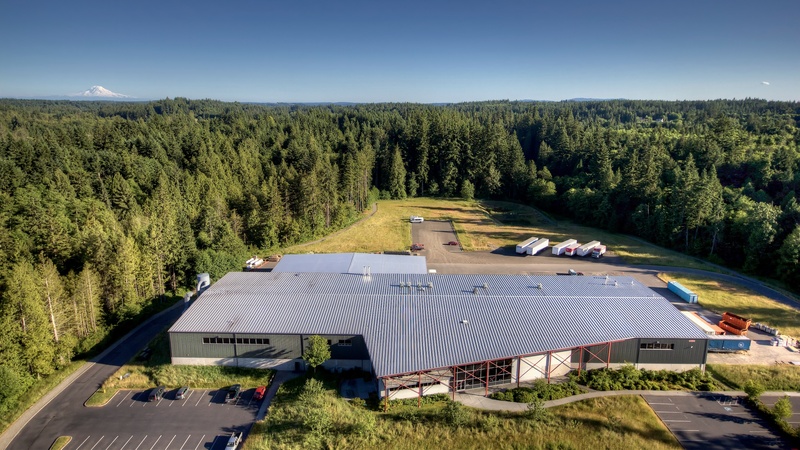 From our unique multipurpose facility to lush natural landscaping and our innovative manufacturing equipment and approaches, environmental ethics permeate all facets of the business, from our facilities, processes and practices to the products we deliver. Evidence of our efforts can be found throughout our facility and in our products, and we take pride in these accomplishments. 1. What’s Up With The Grass? Our factory is located on 33 forested acres near a protected watershed. Lush orchard grass, native vegetation and towering Douglas Firs surround our facility, and it is not uncommon to spot visiting coyote or pheasant on our grounds. The grass is a special 5-Star Pasture Mix that require little to no irrigation, chemical fertilizers, or motorized maintenance. Contrary in appearance to many manicured corporate campuses, our low-maintenance approach to landscaping is a practical environmental solution that requires minimal upkeep and reflects our local heritage. Sawdust makes up one of Watson’s largest waste categories. Just a few years ago, the sawdust from wood routering processes accounted for over 80% of our landfill footprint. Wood dust and debris is also notoriously flammable, difficult to transport, and not readily recyclable through municipal avenues. 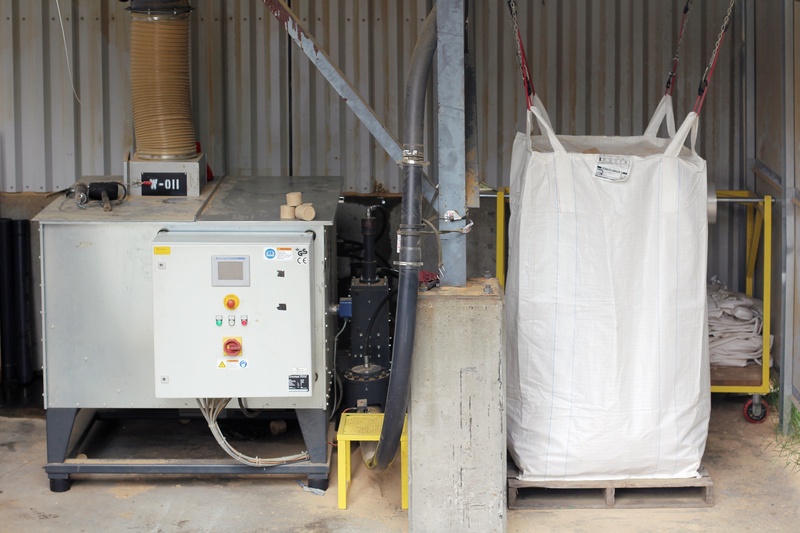 On the surface it appeared that the sawdust was fit only for a landfill, but rather than accept this as status quo, the Watson team researched the issue and decided to invest in equipment to convert sawdust waste into Presto log-like briquettes. In its new compressed form, the sawdust is transported and used as biomass energy by a neighboring pulp and paper mill in Port Townsend, WA. Today, all of our sawdust waste is recycled as biofuel. Since the acquisition of the briquetter in 2011, we divert over 185 tons of sawdust from the landfill each year. What’s important to recognize about this acquisition is that the ROI took four times longer than most justifiable investments. So while the cost of landfill disposal was converted into a value stream, the financial benefit wouldn’t be realized for 7 to 8 years. This investment reflects Watson’s willingness to do the right thing even when the return is modest. Watson analyzes and monitors its waste and recycling streams which include sawdust, solid wood waste, steel/aluminum, mixed municipal recycling and waste. Currently, 93% of waste materials from manufacturing and office operations are diverted from the landfill via recycling and reuse. Many companies claim “zero waste” status upon reaching a 90% recycling rate. 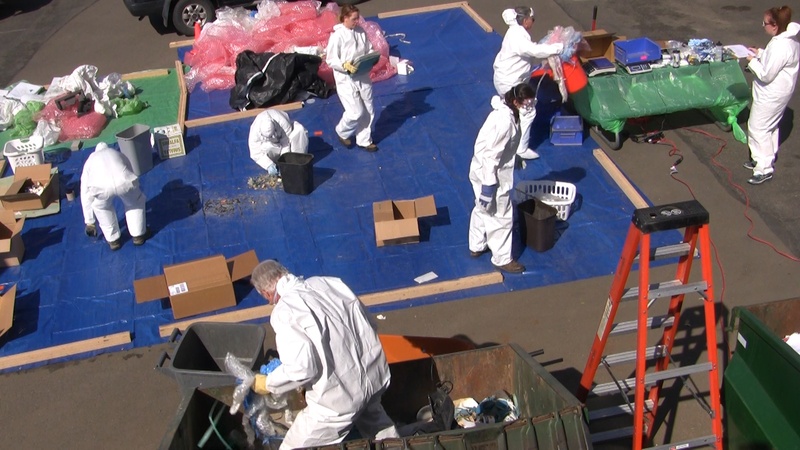 Despite being safely in the range of “zero waste” status, Watson took a closer look at the remaining 7% landfill waste with a dumpster dive or waste stream audit. Staff from all areas of the company took part in the event, sorting garbage and analyzing the waste stream first-hand. Following the waste audit, Watson further reduced its landfill footprint by implementing new programs and refining existing ones. At Watson, you won’t find small-scale initiatives espoused as environmental heroics. Practical Environmentalism makes sustainability a central part of our mission and our environmental programs support long-term business sustainability. By investing in technologies that improve the efficiency of our processes and minimize our waste footprint, we are able to deliver high-quality products that are manufactured with a lasting, sustainable commitment.